This is a guest post by Ben Plomion. In Part 1 of our Ultimate Guide to Search Retargeting, we looked at the players involved in this revolutionary tactic, how it works, and the impressive “Power Ups” it can give your marketing effort. Today, we’re going to look at how to take your Search Retargeting efforts to the next level through Advanced Prospecting. In particular, we’re going to look at two key levels you need to master—traditional Search Retargeting and Search Retargeting on the Facebook Ad Exchange (FBX)—as well as the villains you need to avoid along the way. As we began to discuss in Part 1, Search Retargeting is a practice that allows marketers to target users with display ads based on the keywords they enter into search engines like Google, Yahoo!, and Bing, among others. Unlike Site Retargeting, which retargets past visitors to your site, Search Retargeting unearths completely new prospects. Search Retargeting, in other words, has brought the power of search engine marketing (SEM) to display. As with SEM, the process is driven by the intent that users reveal when they search for something online—after all, people tend to search for the products and services they’re interested in purchasing. And, as with SEM, marketers can purchase the ads as efficiently as possible through real-time bidding. Roughly 25% of Internet traffic in the United States occurs within Facebook, but for a long time, marketers were unable to target users with Facebook ads based on their Internet browsing behavior. In December, that all changed when Facebook named my company, Chango, as a preferred partner in FBX, and we brought Search Retargeting to Facebook. By anonymously capturing the recent search behavior of over 300 million Facebook users, we allow advertisers to launch keyword-specific social advertising campaigns on Facebook that target purchase intent. So, for example, if someone searches for the “Air Jordans,” we allow marketers to take that search data and subsequently target that individual with an ad on Facebook. In addition, we allow marketers to target past site visitors with ads on Facebook in order to compel them to return. FBX has opened up Search Retargeting to the social realm, and it should be a big part of marketing on the world’s most dominant social platform. Captain Confusion: A lot of marketers still think that all Retargeting is Site Retargeting, the practice of targeting past visitors to your site with relevant display ads. Remember that Search Retargeting is a separate tactic, and allows you to acquire truly new customers, unlike Site Retargeting. The Mismeasurer: If you’re only paying attention to clicks, you’re not measuring your display advertising campaign effectively. A study by comScore and Starcom MediaVest found that 84% percent of Internet users never click on an ad. And yet many of those users who don’t click go and buy a product a short time later, just as they would after seeing a TV or print ad. If you’re only measuring clicks, you’ll completely miss the role the ad played in the conversion process. For most campaigns, it’s smart to track how many people were served an ad and how many people bought the advertised product within 7 days. To learn more about this new way of measuring display success, head here. King of the Uncreative: Search data is the driving force behind Search Retargeting, but it won’t do you much good if you’re serving users lame ads. 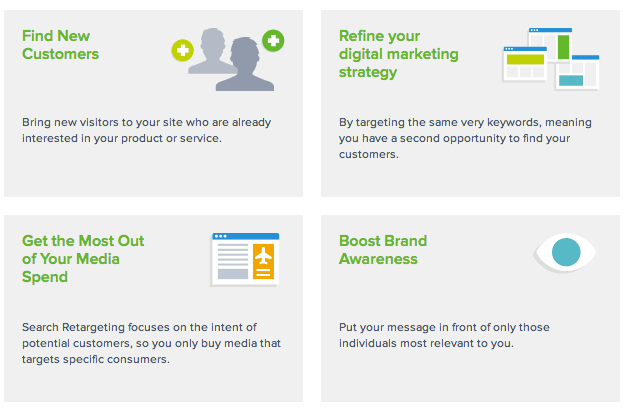 Ensure that you’re serving users dynamic, customized creatives with a clear call to action. Search Retargeting gives you the opportunity to serve each individual the perfect ad. Don’t waste it. Once you’ve mastered these techniques and learned how to evade these villains, you’ll start to see ROI that’s a thing of tech conference lore. However, Search Retargeting — and Programmatic Marketing at large — is constantly evolving, so keep up if you want to stay on the top of your game. Previous articleSTOP YOUR ONLINE MARKETING.